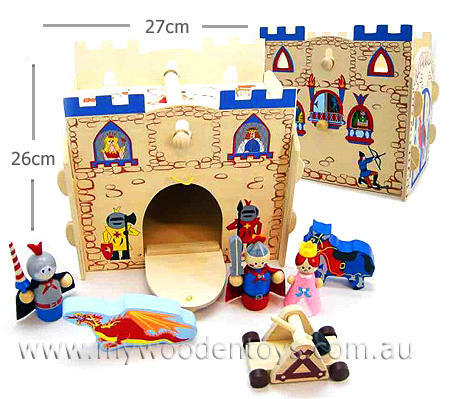 Wooden Toy Castle Playset is a fantastic wooden castle with knights, a princess, dragon, horse and even a trebuchet (weapon to throw things at your enemy). This clever castle has a carry handle incorporated into the turrets so you can take it anywhere and it is a very portable size at 27cm long x 26cm high. The whole castle comes to pieces so you can take it apart and re-build it as many times as you like. On the back wall there is a disc you can turn which shows different images in the castle window. There is a working door with an elastic latch so when you have finished you can pack all the characters away safe inside the castle. This is a wonderful role-playing toy and lovely to see all the figures included. We like this because: "A wonderful size and sweet little characters included. "